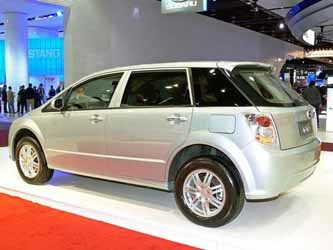 As the latest star in a rapidly expanding portfolio of green, high-tech products, the all-new BYD e6 electric vehicle is being unveiled at the 2009 North American International Auto Show in Detroit. The five-passenger e6 will be marketed as a family-oriented crossover vehicle. The pure-electric e6 features BYD's revolutionary battery technology - what we call the Fe battery. The range per charge is expected to be a remarkable 249mi (400km). Performance is surprisingly brisk, with 0-60mph (0-100km/h) acceleration in less than 8 seconds and a projected top speed of 100mph (160km/h). What sets the e6 apart from other pure electric vehicles are its size and performance. With current battery capacity limited, most other manufacturers have elected to focus on small, lightweight EVs that stress efficiency over performance and range. BYD, as a young brand with a rich history of IT development and cutting-edge battery R&D, has the drive and extroverted personality to take an unconventional approach and manufacture cars that embody the company's slogan, Build Your Dreams. That's the spirit and underlying philosophy behind the e6. The high-tech e6 boasts the exterior dimensions of a typical American family vehicle, with ample interior space that provides substantial legroom and headroom for passengers, plus a generous luggage compartment. The e6 measures 179.3 inches (4554mm) long, 71.7 inches (1822mm) wide and 64.2 inches (1630mm) tall. The pure-electric e6 is environmentally friendly, eliminating toxic emissions and greenhouse gases while driving. BYD's new Fe battery takes this "green" philosophy a step further: All chemical substances used in the battery can be recycled. And while the range of many electric vehicles is restricted by their battery capacity, making it inconvenient to travel long distances, the BYD e6, with its high-efficiency Fe battery, can go up to 249 miles (400km) on a single charge. That makes the e6 suitable for daily commutes, around-town chores and even long journeys. The BYD F3DM Dual Mode electric vehicle is based on the standard gasoline model BYD F3, which is one of China's best-selling cars. The DM designation stands for Dual Mode, which indicates the vehicle can run on either pure battery power or a combination of gasoline and electricity. The F3DM extends the range, performance and fuel economy of the F3. The F3DM features a small gasoline engine, a permanent-magnet synchronous electric motor and BYD's high-efficiency Fe battery pack. The 1.0-liter gasoline engine and electric motor deliver a combined 168hp (125kw) and 295 lb-ft (400Nm) of torque. The combined range is 360miles (580km), with 0-60 mph acceleration in 10.5 seconds and a top speed of 93mph (150km/h). On battery power alone, the F3DM has a range of 62 miles (100km). The F3DM's Fe battery pack can be quick-charged to 50 percent of its capacity in only 10 minutes. It can be fully recharged from a normal household power outlet in seven hours. The BYD F6DM Dual Mode electric vehicle is based on the standard gasoline model BYD F6. Like the F3DM, the larger and more luxurious F6DM features a small gasoline engine, a permanent-magnet synchronous electric motor and BYD's high-efficiency Fe battery pack to extend the range, performance and fuel economy of the F6. The F6DM shares the F3DM's 1.0-liter gasoline engine and electric motor, which deliver a combined 168hp (125kw) and 295 lb-ft (400Nm) of torque. The combined range is 267 miles (430km), with 0-60 mph acceleration in 13.0 seconds and a top speed of 93mph (150km/h). On battery power alone, the F6DM has a range of 62 miles (100km). The F6DM's Fe battery pack can be quick-charged to 50 percent of its capacity in only 10 minutes. It can be fully recharged from a normal household power outlet in seven hours. BYD is introducing a new version of its high-end F6 sedan - the F6 CVT, featuring a continuously variable transmission and a powerful, efficient 2.0-liter gasoline engine. The BYD483QB four-cylinder engine delivers 138hp (103kW) and 137 lb-ft (186Nm) of torque. It is mated to a three-mode CVT transmission, which includes driving mode, sports mode and manual mode. Among the amenities on the F6 CVT are a multimedia entertainment system, GPS navigation, radar backup system, dual-zone climate controls and an adjustable steering wheel. The F6 CVT is outfitted with such advanced safety features as front and side air bags and four-wheel disc brakes with ABS and electronic brake-force distribution (EBD). BYD sees environmental responsibility as a core value and a critical factor in the company's long-term success. For that reason, it spent three years and thousands of hours to design, engineer and develop its new minicompact, the BYD F0. The F0 hatchback combines a jaunty design in a popular size and shape with BYD's own unique cues and characteristics. It is brimming with premium fashion features: A dynamic exterior and warm, inviting cabin are specially designed for the new generation. By building in high quality at an affordable price, the BYD F0 promises to attract a wide range of buyers looking for a great value without compromising safety, performance or fuel economy. The F0 sports a peanut-like shape and an animated face with fluid headlamps and a distinctive grille. The interior is comfortable and friendly, with white-LED instrumentation that pops out of a soft blue background. The integrated rear seats can be completely folded to provide additional space. An adjustable steering wheel provides additional flexibility. The F0 is powered by a lightweight BYD371QA all-aluminum 1.0-liter three-cylinder engine fitted with Bosch electronic control systems to help enhance fuel efficiency and meet stringent emission standards. The ride is stable and controlled, thanks to a relatively long wheelbase and a well-engineered suspension system that includes MacPherson struts in front, a torsion-beam setup in the rear and a stabilizer bar to help minimize body roll. Safety features include air bags and ABS with electronic brake-force distribution. BYD, a global leader in advanced battery and electronics technology, has devoted thousands of hours and hundreds of millions of dollars to the development of new-energy vehicles and systems. Chief among the company's core values is to provide consumers around the globe with safe, efficient and environmentally friendly products. BYD began research and development of electric-vehicle batteries in 1996. In late 2002, the company formally established the Electric Vehicle Project Department, launching an R&D program on pure electric vehicles. Four years later, in 2006, this group evolved into an independent division with more than 1,000 engineers, focused on research, development and pre-production of electric vehicles and components for new-energy vehicles, including pure electric vehicles and Dual Mode (DM) electric vehicles. BYD's advanced Fe battery is notable not only for its efficiency, but also for its high degree of safety. During rigorous testing that included impact, crush, nail penetration, and high/low temperatures, the Fe battery remained intact, with no evidence of leakage or overheating. Further, the Fe battery has proved rugged and durable, good for 2000 cycles (fully charged and discharged). Besides safety and long cycle life, low cost is another key factor in commercializing EVs. The price of iron is well below the price of other battery ingredients, such as cobalt; thus, the cost of BYD's Fe battery is far below that of Li-ion cobalt batteries. The production and use of the Fe battery is eco-friendly: No pollution or harmful emissions during production, and the material and chemicals used in the Fe battery are completely recyclable. Thanks to its long experience and leading position as one of the world's top battery manufacturers, BYD also has the knowledge and ability to maintain the high degree of consistency and quality required to produce advanced, high-tech batteries that are 100% defect-free. BYD has been working to resolve several challenges in developing new-energy vehicles, including the cost of battery packs and the limited range of most current pure-electric vehicles between battery recharges, a condition which also applies to hybrid electric vehicles when operating in electric mode. Thus was born BYD's Dual Mode series - DM for short. BYD's Dual Mode (DM) electric vehicles combine a pure-electric mode with a hybrid drive system that incorporates a small gasoline engine. The Dual Mode (DM) electric vehicle system integrates an advanced generator and motor controller, which results in lower fuel consumption and emissions, as well as higher power and performance. As the Dual Mode name implies, the DM system takes advantage of multiple energy supplies via recharging and refueling. If we refer to the pure electric mode as EV and the hybrid electric mode as HEV, then BYD's DM is simply "EV+HEV." We believe this advanced system eventually will take the place of more conventional hybrid systems, and become the most popular hybrid vehicle system in the world. The BYD DM is a Dual Mode electric vehicle system which brings together an Fe battery pack, a facility for recharging the battery from an external power source and control software that allows a deeper battery cycle so that the vehicle can operate solely on electricity over short distances (typically up to 60 miles) until the battery charge level is almost exhausted. In our daily lives, most people (about 95%) will drive fewer than 60 miles per day. BYD's Dual Mode (DM) electric vehicles can run at zero-fuel-consumption and zero-emission levels under the pure EV driving mode. When the vehicle needs more power to accelerate, a gasoline engine and an electric motor drive the wheels together to provide greater output and torque. Under deceleration and braking, the electric motor acts as a generator to recover kinetic energy and convert it to electrical energy, which is stored in the high-performance battery for later use as motive power. Thus, with a perfect integration of electric motor and gasoline engine, BYD's Dual Mode electric vehicles can run up to 360 miles (580km) on a single battery charge and a full tank of gasoline. During typical operation, the electric motor uses the energy stored during regenerative braking, enabling the gasoline engine to be used primarily in its more efficient operating range. The electric motor also provides maximum torque from standstill, as well as providing additional torque for acceleration, enabling the use of a smaller gasoline engine. BYD's Dual Mode (DM) electric vehicle system uses a small gasoline engine and an electric motor with a combined output of 168hp (125kW). This Dual Mode drivetrain performs like a standard 2.4-liter gasoline engine, although at much lower cost, to give owners a new driving experience. The Dual Mode (DM) electric vehicle system developed by BYD provides owners with greater convenience, since the vehicle can be recharged using a normal household power outlet instead of a commercial charging station. The Fe battery can be charged to 50% power via quick charge in 10 minutes, and 100% via household charge in seven hours. BYD Auto is a subsidiary of BYD Company Ltd., which is listed on the Hong Kong Stock Exchange. In 2003, the parent company became the world's second largest rechargeable-battery producer. In the same year, BYD Auto Company Ltd. was founded. Today, BYD's nickel batteries, mobile-phone lithium-ion batteries and mobile-phone components occupy the major shares in their respective global market segments. BYD has more than 130,000 employees worldwide, and its market value has surpassed $7 billion. From the first day of its founding, BYD Auto has devoted itself to the research, development and manufacture of world-class products, including electric vehicles and Dual Mode (DM) electric vehicles. Aiming to meet the increasing demands of global customers and relying upon BYD's unparalleled strength in technology and capital while leveraging China's abundant manufacturing resources, BYD Auto has fully integrated all aspects of the automotive industry, thereby tremendously reducing its costs and significantly upgrading its quality. Currently, BYD Auto has established large-scale industrial bases in several locations in China, as its R&D and vehicle manufacturing operations have rapidly developed. Within only five years of its founding, BYD Auto has successfully unveiled a series of new models, including the F0, F3, F3R, F3DM, F6, F6DM, F8 and e6. Over the next few years, BYD Auto will continue to expand its product portfolio to include a broad range of F-series sedans and hatchbacks, S-series crossover vehicles and M-series multipurpose vehicles. Its hallmarks will remain cutting-edge "green" technology, safety, reliability, quality and affordable prices. Besides the development and production of traditional gasoline vehicles, BYD Auto will continue to develop and promote new-energy vehicles, including its Dual Mode (DM) electric vehicles and pure-electric vehicles. Warren Buffett's recent investment in BYD Company has definitely boosted our confidence in bringing new-energy vehicles into the North American market. BYD President Wang Chuanfu has said the investment will enhance BYD's brand recognition in the United States, and will speed up the company's pace in entering the auto market there.